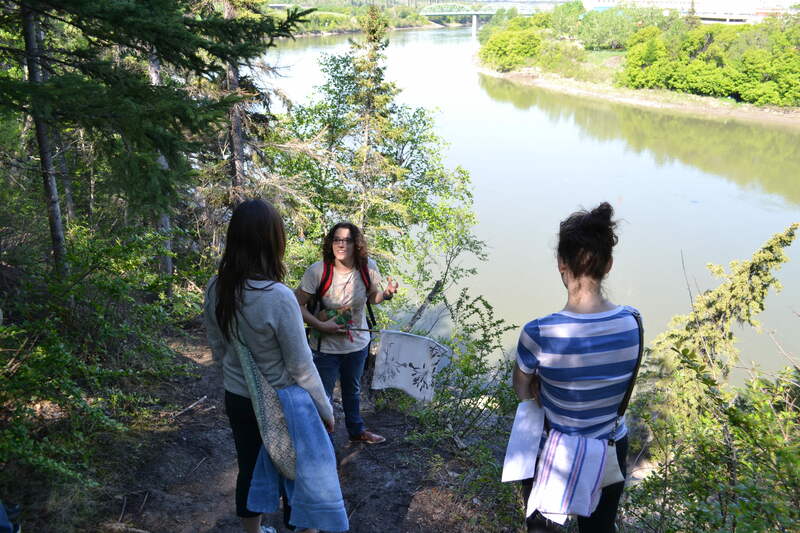 One of my favourite pictures from the whole Shareables enterprise, from last summer’s walk on Plants in the River Valley. Last summer, when I went door to door looking for people who wanted to show off their backyard garden for Shareable Neighbourhood, and everything they knew about growing plants, one person whose door I knocked left a thought with me in return. She was asking about the motivations and mission behind Shareable Neighbourhood, and with her I played up how much I wanted to give neighbours an opportunity to get to know each other better, and feel a little more tightly woven — like they had people around them they could rely on. She seemed dismissive of the idea. Old Strathcona and Mill Creek already have lots of community groups, she said. Don’t you think there are enough already? Since then, I’ve kept worrying that maybe she’s right. Especially on days like the Urban Birds walk or the Death in the River Valley walk, when only a handful of us showed up. But thinking about how Punctuate! player Adam Cope recently took his own life, and a classmate named Alex before that, and Ross Moroz before that, have convinced me that she’s wrong. I feel like Holden Caulfield at the end of Catcher in the Rye. How he sees himself in that field, watching all those kids falling, and can’t help but feel like he’s got to catch them all. I knew Adam. I knew Ross. I didn’t know how to save them — didn’t even know they needed saving — but I feel like I understand their despair. Like life is too painful, too unbearable, and it’s relentless. It never stops. And it can feel like you don’t have any options, any ways to make it better, or make the pain go away. I’ve felt that pain before, and it’s only because I felt how strong the web of care was around me that I clambered out. In ecology, we recognize that systems are more resilient when they’re more complex, with greater interconnections. Simplified ecosystems, with only one genetic variety of a plant or too few pollinators, are more vulnerable. If anything happens to one component, the whole thing could collapse. In human communities, the same thing is true. Organizations are susceptible to collapse if too few people are doing all the work. If one gets sick, it can throw the whole organization into crisis, or more often, people will make themselves sick by taking on more than they can really handle. Shareable Neighbourhood is partly an attempt to make our neighbourhood more resilient by showing people that they have something to offer, and others appreciate and recognize it. Recognizing that worth in one another can light up both individuals, and nurture their care and compassion for one another. Maybe, one day, when one needs help, they’ll think of the other and be less shy to ask. Doing small things with great love and compassion to create compassionate communities goes a long way! < Cutting Room Floor: Why all the rain?